Yesterday, I’d swear I saw this tree in our backyard turn from summer to fall over the course of the day. It seemed to happen that fast. With this summer’s drought, many trees in the area have foregone fall color altogether, their leaves having turned brown on the branch weeks ago. Now, before we even get to September, I’m seeing signs of fall color as the linden trees hint at yellow and the tops of burning bushes blush red. Just as our spring and summer seasons came odd and early, it looks like Fall isn’t waiting for the last of the summer months to end before it makes an appearance. On my own serviceberry tree, which seemed to go from light green to peach in the blink of an eye, a closer look at the leaves illuminates the strangeness of the season. The green of the leaves has been baked out and the fall color appears to be creeping on to each leaf in a frozen wave. As best as I can tell, our fall is a good three to four weeks early, keeping us on the same timeline as our early spring and summer. At this rate, the leaf peepers best get out there early, we could have snow by Halloween. This will be our second summer with the new backyard and everything is well established at this point. I thought it would be fun to track the progress of plants as they bud, bloom and leaf out. We’re having an unseasonably warm and early spring (temperatures in the 80s! in March!!) so the timing of everything seems a bit out of whack. These daffodils beat the hyacinth by almost a week, which is unusual. 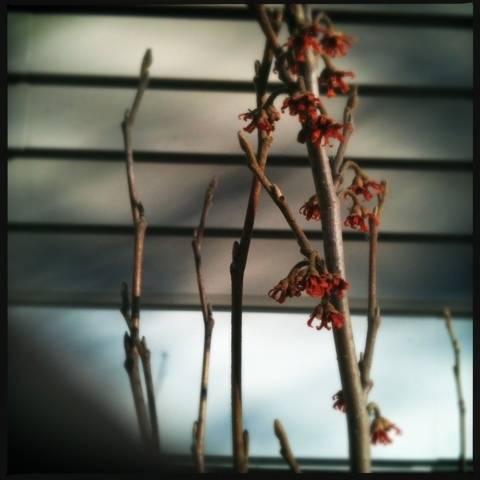 The witchhazel was the first thing to bloom (as usual), but it too bloomed weeks ahead of schedule. On the opposite fence, the climbing hydrangea is starting to leaf out all over, a sign that this plant is much healthier than the one it replaced last summer. That one seemed half dead on arrival and never really took off. This one already shows great signs of promise. The small spirea doesn’t look like much, but it’s become one of my favorites in the backyard. It changes constantly throughout the season, starting off with vibrant yellow-green leaves that darken with the summer and turn a beautiful ruby red in the fall. In June, pink flowers will begin to appear and if you keep it pruned back, the plant will bloom all summer. Its shape reminds me of a non-stop firework. One of my favorite plants in the yard. 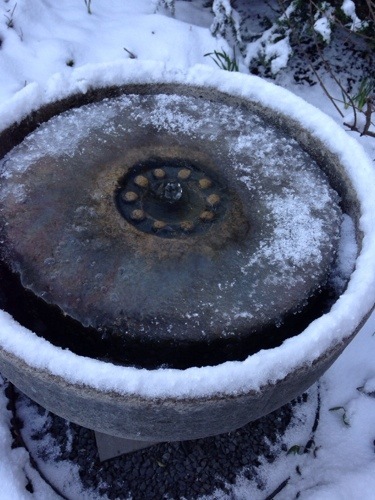 The fountain is still covered up, but not for much longer at the rate our weather pattern is going. 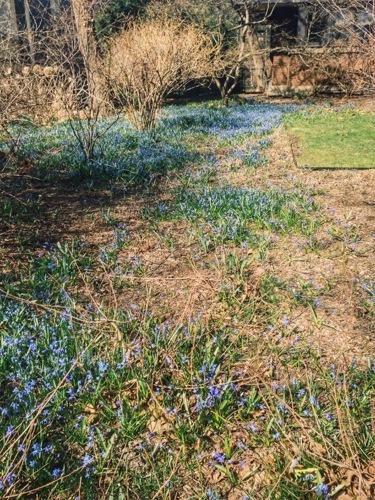 The tiny irises are the first to bloom in this section of the backyard. Peak fall color is rolling through my backyard in stages. The serviceberry began turning a few weeks ago and has now nearly lost all its leaves. Those that are left are a final flash of peachy red. Following our recent cold snap, the witchhazel suddenly transformed into a wall of bright yellow. In my backyard, the blooms of summer are out-performing the flowers of fall. Last year about this time, we gutted the backyard and put in all new plantings. This year, we did the same in the front yard. I’ve become the unofficial gardner for our town home association and have muddled along for years, trying to replace the terrible looking beds and patches of grass with something more attractive and sustainable without depending on constant watering. With diseased trees in need of replacing and trouble patches that needed help, it was definitely time to call in the professionals. Saturday was the day when all the plants went in the half of the beds that we’re planting this year. (The remaining beds will planted next year.) Plants incorporated in the landscaping include astilbe, hydrangea, hosta, gooseneck, bleeding heart, turtlehead, ladies mantle, fern, catmint, and witch hazel. We also planted a couple of kousa dogwood which I’m really excited about. The whole thing looks great and I couldn’t be more pleased with how it turned out. For the next two weeks, I’m on watering duty, which takes about two hours of shifting hoses around every day. I’ll post some photos once I process them. I received a six-pack of Full Circle from a neighbor as a thank you and I was reminded how much I enjoy this beer. A good choice for summertime in the backyard. Here I am, conducting an experiment to see which would last longest: the beer, my laptop battery or the light of day. The battery and the daylight died at about the same time, shortly after I finished the beer–all about 30 minutes after I took this picture. Another hot day at the garden.